Spend three days at a beautiful campsite in remote Uttarakhand, in the company of blooming wild-flowers, tall pine trees, cooing alpine birds and rolling hills on the horizon. On a guided village walk from the campsite, explore the mountain slopes that are dotted with small communities with smiling villagers and little kids. A short hike from the campsite can also take you to the local Syahi Devi temple, a great way to spend the afternoon. At an additional cost, you can also explore the traditional Kumaoni culture with a local guide on heritage walks in Ranikhet and Almora. 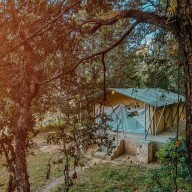 A culture-rich experience of Uttarakhand, this glamping trip near Ranikhet is a great way to escape the city life and spend a few days in the mountains. 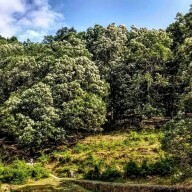 Perched on terraced mountain slopes, your campsite in the hills of Uttarakhand is surrounded by pretty forests of thick oak trunks and towering, thin pine trees. These forests are home to a number of exotic, native and migratory birds, turning the campsite into a bird lover's paradise. With idyllic scenery all around the campsite, you can simply grab a hot cup of tea and spend hours with blissful views of the mountains and the old world charm of villages. At the campsite, you'll spend the night in large Swiss tents with a personal sit-out area and attached bathroom with hot water supply. Inside the tent, you'll have clean linen, soft beds, small table with chairs along with racks for your luggage. You'll enjoy delicious meals that offer a mix of Indian and continental cuisine, cooked with locally-sourced ingredients for a dash of the traditional Kumaoni taste. 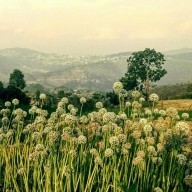 • Go glamping, or glamorous camping, in the hills near Ranikhet. • Spend three days in the rustic interiors of Uttarakhand. • Experience the rich Kumaoni culture of the villages. • Go on short walks to get photogenic view of the woods. • Spot brightly-coloured, alpine birds chirping in the trees. 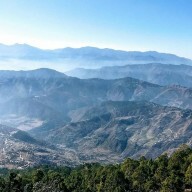 Glamping near Ranikhet is a non-strenuous activity. 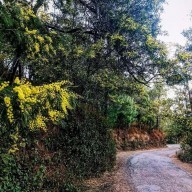 However, travellers with pre-existing medical conditions are advised to consult with their personal physician before booking this luxury camping trip near Ranikhet. Travellers are required to carry a valid government-issued photo ID. 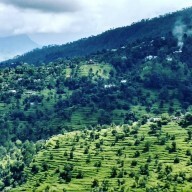 Consumption of alcohol, drugs and tobacco products like cigarettes is strictly prohibited during the Ranikhet glamping trip. For cancellations made more than 7 days before check-in date of the Ranikhet glamping trip: 100% refund. 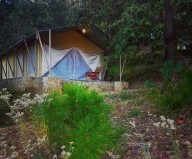 For cancellations made between 3-7 days before check-in date of the Ranikhet glamping trip: 50% refund. For cancellations made between 48-24 hrs before check-in date of the Ranikhet glamping trip: 25% refund. For cancellation made less than 24 hrs before check-in date of the Ranikhet glamping trip: no refund. Please note that check-in time is 12:00 hrs while check-out time is 10:00 hrs. Early check-in and late check-out is subject to room availability. Bookings for children younger than 6 years, without an extra bed, are not charged. Bookings for children between 6-12 years of age are charged at 25% of the full price. Bookings for an extra adult, older than 12 years, in the tent are charged at 40% of the full price. 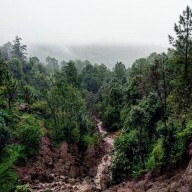 There is no pick-up for this glamping trip near Ranikhet. There is no drop-off for this glamping trip near Ranikhet. 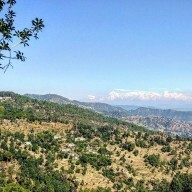 Day 1 of glamping in Ranikhet: Check-in and enjoy! Check-in to your comfortable tents by noon. Take some time to settle down, leave your luggage in your tents and head out for a short walk to explore the property. You can spend the rest of the day at leisure. 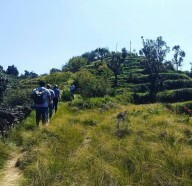 Sign up for a guided walk to explore the villages or go on a short hike to the Syahi Devi temple. In the evening, have a delicious dinner and spend the night gazing at the twinkling stars above. Overnight in tents at the campsite. 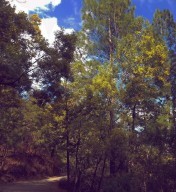 Go on a short hike from the campsite to enjoy the vibrant green woods. Wake up to a lazy morning and take a walk to hear the morning birds and get misty dew-soaked view of the forests. Today, you can spend the the entire day at the serene campsite, swiming in a hammock with a book with beautiful views of the mountains. At an additional cost, you can also sign up for guided heritage walks to explore the Kumaoni culture in the towns of Almora and Ranikhet. The campsite can also arrange for a yoga instructor for a short session. Subject to availability, vehicles can take you out for a night drive in the evening to enjoy some nocturnal views of the hills. Overnight in tents at the campsite. Wild flowers blooming on mountain slopes around the campsite. Wake up to a cup of hot tea and morning views of the misty wild flowers, trees and meadows. After a filling breakfast, you'll check-out of the campsite by 10:00 hrs. Your trip ends here. Panoramic view of rolling hills that extend till the horizon. Personal expenses such as additional meals, alcohol or beverages etc. Overnight in tents at the campsite. Check-in time for today is 12:00 hrs. You'll be accommodated in a large Swiss tent with a sit-out area and an attached bathroom with running hot water. Your tent also includes a soft bed, clean bed sheets and blankets, a clothes and luggage rack, electricity, and a little dining area of a table and chairs. Each tent can accommodate 2 adults and 2 kids or 3 adults. Today's package includes dinner only. Inside view of the glamping tents. You'll be accommodated in the same large Swiss tents at the campsite as yesterday. Today's package includes breakfast and dinner only. At an additional cost, the campsite offers multiple activities like guided heritage walks, short hikes and drives that can be booked on the spot or in advance. Inside view of the glamping tents: attached washroom. You're trip ends by 10:00 hrs. Today's meal package includes breakfast only. All meals will be cooked in continental or Indian cuisines with a Kumaoni touch. Check-out time for today is 10:00 hrs. Common lounge area to rest and relax. The campsite, accessible via road, is located 3-hr/80-km drive away from the Kathgodam railway station. You can board a train to the railway station and hire a private cab to reach the campsite.